In earlier days labours used to unload the materials from a truck. To save time, a hydraulic system have been utilized to lift the body of the truck to unload the materials, called “Tippers” and “Dumpers”. In the process only Tippers and Dumpers were used to carry certain materials. 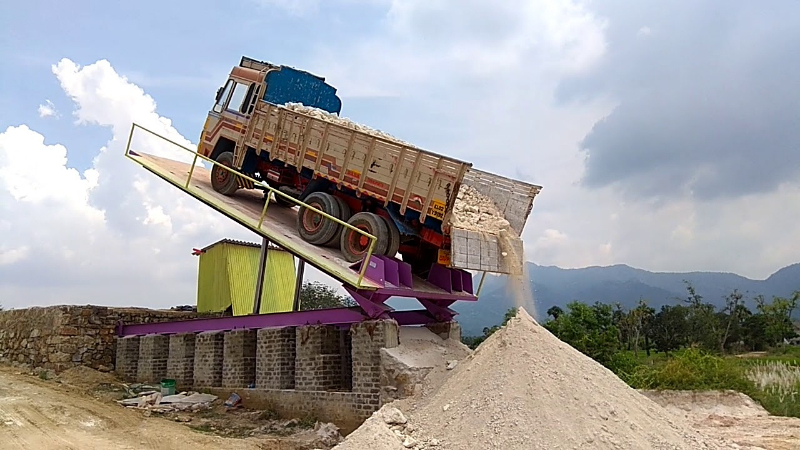 Hydraulic Truck Unloaders have been introduced to unload the materials by tilting the whole truck. 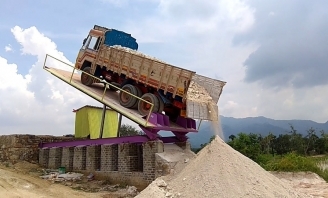 The transportation of the materials are no more restricted within Tippers and Dumpers. Any fixed body truck also can be unloaded by a Hydraulic Truck Unloader (HTU). A Hydraulic Truck Unloader is an antiskid platform on which a loaded truck can be rolled backward until the stopper. Front axle are locked. Platform is tilted by two or three hydraulic cylinders. After a certain angle materials start dropping through tail door of the truck. The platform tilting angle is limited to 50 degree to 55 degree to ensure complete unloading of the materials. We supply Hydraulic Truck Unloader (HTU) and Spare parts. We also undertake Repairing, Servicing and Upgrading of Hydraulic Truck Unloader . The Hydraulic systems are being used in almost all Industrial Houses. These are widely used in various kinds of Materials handling Equipments e.g. Forklift Trucks, Reach Stackers, Hydraulic Cranes, Dumpers, Dozars, Payloaders, Excavators and Hydraulic Truck Unloader , etc. We supply Hydraulic Cylinders, Power packs, and Indian & Imported spare Parts for material handling equipments. We also undertake Repairing and Servicing of the said Equipments.